A lack of ramp access to and from the northern end of the Sydney Harbour Bridge has long been a source of frustration for bike riders. 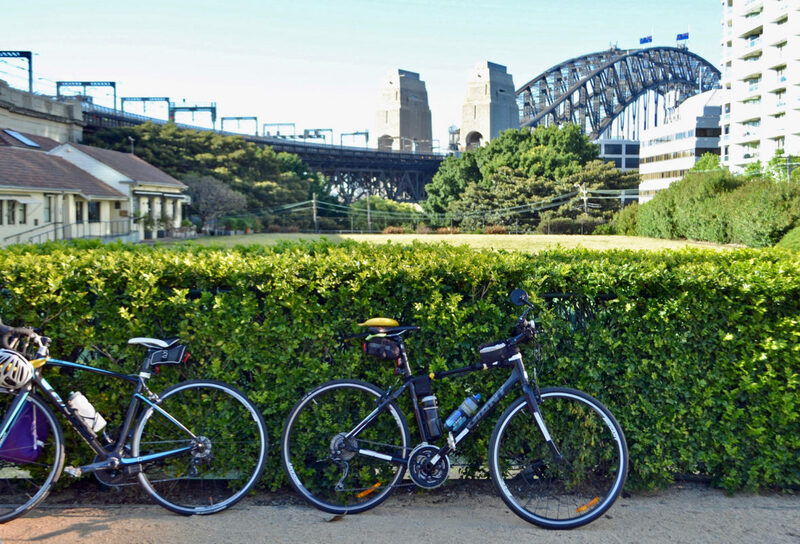 With more than 2,000 daily bike trips, the Sydney Harbour Bridge cycleway is the busiest link in Sydney’s metro bike network – yet each morning riders and pedestrians are forced to navigate 55 steps to access the city’s iconic bridge. The stairs prevent the elderly, parents with prams, kids, people with disabilities and other would-be bike riders who cannot physically get their bike up the steps from cycling into the CBD from the northern suburbs. As a result, many cyclists commuting to the city have been forced into taking the ferry to Circular Quay before getting on their bike. It’s simple – build a new ramp to replace the infamous steps and provide a connection to the future North Shore Link Cycleway. A new ramp will improve connectivity and accessibility to the existing and future metro bicycle network. 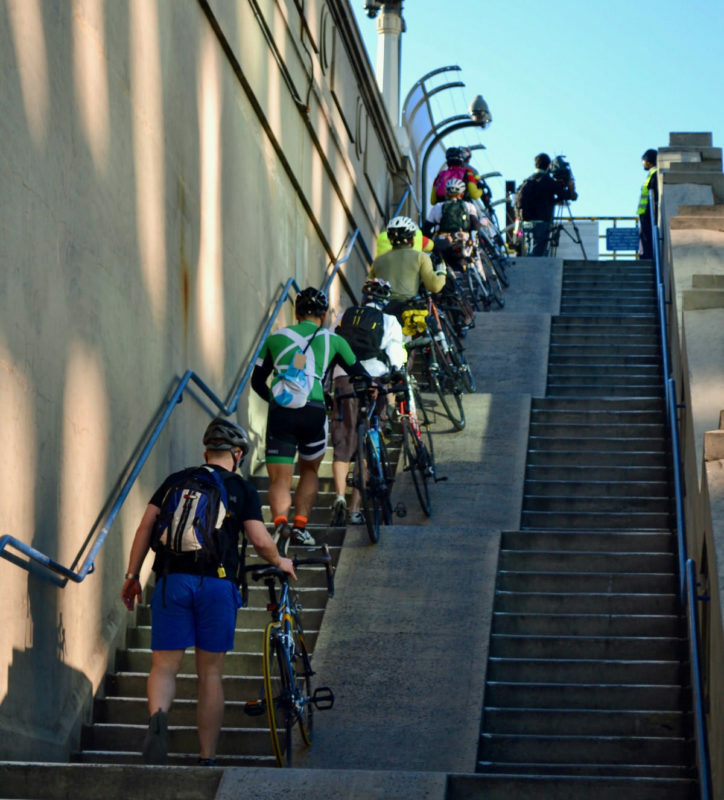 The removal of the steps is also an important step forward in transforming Sydney into one of the world’s top riding destinations. For years, Bicycle Network has been campaigning to see a ramp built to replace the Sydney Harbour Bridge steps. Despite limited details, things started to look positive with a series of announcements beginning in 2016. However, until we see solid timelines or a shovel in the ground, we will continue to campaign for the removal of the Sydney Harbour Bridge steps. We can appreciate that sometimes, these things take time. But we’re starting to get a little impatient. We’ll make sure that decision-makers are held to their word and that the ramp meets the needs of people who ride bikes. the NSW Government announced plans for a ramp on the northern end of the bridge. Plans for a 200 metre ramp on the north side of the Sydney Harbour Bridge were once again confirmed as part of $35 million in funding but the detailed were decidedly light (sadly this website has since been removed). As part of $35 million in funding from the state government, a new dedicated cycleway would also be constructed from the southern end of the bridge to Kent Street in the central city, removing the need for cyclists to use roads or shared footpaths. At the time, Roads Minister Duncan Gay told the Sydney Morning Herald that the new ramp and cycleway would allow cyclists to ride more easily over the bridge, which he described as the “best cycleway in the world”.”We are putting important infrastructure in for the future of the city and for the future of cycling,” he said. Following an announcement in September by Roads Minister Melinda Pavey community consultation was set for November and December 2017. Designs for both the northern and southern end of the Sydney Harbour Bridge cycleway opened for public comment until the 15 December, 2017.
provided a dedicated connection for bike riders from the cycleway to the Kent Street Cycleway and an improved shared bridge over the Cahill expressway. Bicycle Network prefers Option 2 (page 24) for the northern side of the bridge, providing a straight ramp supported on columns parallel to the western bridge approach wall through Bradfield Park. Read Bicycle Network’s comments on the proposals. At a press conference Roads Minister Melinda Pavy announced that people who ride bikes will have to wait another two years before we see final plans and funding methods. Roads Minister Melinda Pavey said there were “some big challenges” to the project including Milsons Point residents who fear the ramp will detract from their views of the Sydney Harbour Bridge and impinge on nearby Bradfield Park. Instead, the government has decided to prioritise construction of lifts at either end of the bridge, the cost of which has blown out to about $15 million, from $10 million. North Sydney Councillor Gibson said residents preferred construction of a lift for cyclists. Our campaign continues – together we can fix the Sydney Harbour Bridge steps. Tell Roads Minister Melinda Pavy that people who ride bikes simply can’t wait another two years for action. Help make our voice even stronger in NSW. Join us and together we can fix the Sydney Harbour Bridge steps. Help keep the pressure on and hold our pollies to account by sharing this campaign on social.